THE WEEKLY WRIGHT-UP: The Next Generation of Flooring: Magnesite, Star Trek and Frank Lloyd Wright's Favorite Material of the "Buffalo Venture"
The Next Generation of Flooring: Magnesite, Star Trek and Frank Lloyd Wright's Favorite Material of the "Buffalo Venture"
It wasn't easy, but I've found a connection between the Star Trek and Frank Lloyd Wright universes: magnesite. 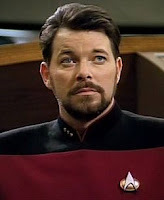 While watching an old episode of Star Trek: The Next Generation (thank you, Roku), I stumbled upon a familiar term: Commander Riker exposed an elicit cargo of magnesite, smuggled by Klingon femme fatales, Lursa and B'Etor in the episode "Firstborn." At first, I scratched my head and thought it must be one of those exceedingly rare and fictional elements they're always referring to (e.g. dilithium - fictional in the Star Trek universe). But no, magnesite is simply magnesium carbonate, a compound relatively common on earth, and used in steel and synthetic rubber production and...as a binder in flooring material. This is where Frank Lloyd Wright and his Buffalo buildings come in: Wright specified a building material commonly called "magnesite" - though it's really an aggregate of magnesium carbonate and other materials such as excelsior ("wood wool") - for both the Martin House and the Larkin Administration Building. In the Martin House, "magnesite" was used as a flooring surface in the basement level and second floor. 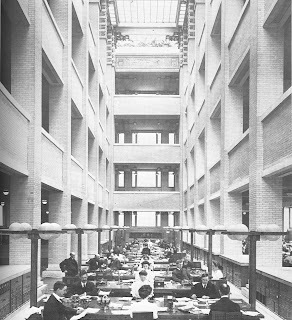 In the Larkin building, it was used even more extensively, incorporated even in some of the desk tops and other Wright-designed metal furnishings (see Quinan, Frank Lloyd Wright's Larkin Building: Myth and Fact, p. 56). The light court of the Larkin Administration building. In both buildings, "magnesite" was specified primarily as a fireproofing, and thus contained one of the most fireproof materials known at the time: asbestos. Rest assured that the magnesite in the Martin House was removed under safe abatement protocols, and the replacement material is asbestos-free. 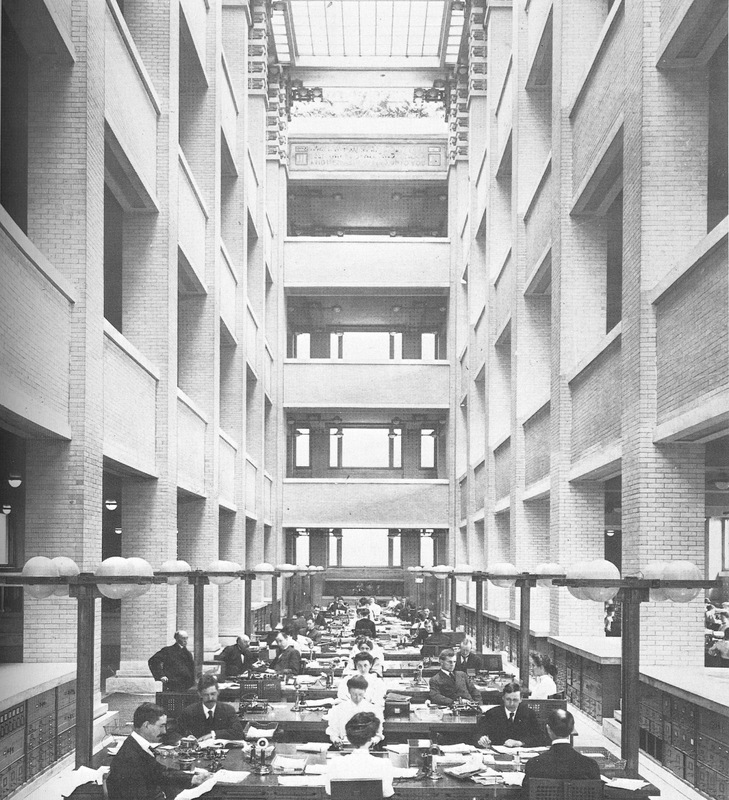 In the Larkin building, "magnesite" was also employed to absorb the cacopohony of sound generated by hundreds of typewriters and other business activity. 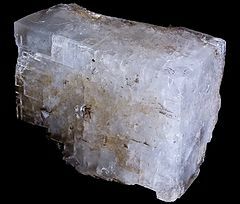 So perhaps a universal translator is required to distinguish magnesite from "magnesite," but it's one term shared by Frank Lloyd Wright's 20th century "Buffalo venture" and the Enterprise's 24th century star trek. magnesite - a substance known to create confusing quantum singularities in the blogosphere.